Road trips are the perfect way to break the routine monotony. A road trip with a group of best friends, family or loved ones is the therapy we all need once in a while. The time spent on road trips brings us closer, an excuse to catch up after a long time. Hyderabad, the city known for its delicious biryani and spicy food, is blessed with quite a few places around the city that can be travelled to within a time frame of 2-3 days, ideal for a weekend getaway. And if you're from Hyderabad or any place nearby, then this is the article for you! Here are some of the places you can plan for a road trip from this City of Pearls. Formerly known as Palamoor, Mahabubnagar is a place located just 108 km from Hyderabad. The city used to be the centre of both Chalukya and Satvahan Dynasty in the past, which is why the region has many places of historic and religious significance. Farahabad is a beautiful place nestled on the Nallamala Hills of the Eastern Ghats. It houses a brilliant mosque, apart from which activities that can be done here include trekking, and jungle camping. Pillalamarri - an 800-year-old Banyan tree and Mallela Theertham Waterfalls are some of the other places to visit in Mahabubnagar. Another quick road trip that can be done is to the regal town of Bidar, located 146 km from Hyderabad. This hilly city is a crown of Karnataka and a great place to visit. The most important and popular tourist place here is the Bidar Fort, a beautiful ruined monument which is now a favourite spot for shooting movies. Narasimha Jhira Cave Temple, Bahmani Tombs are the other beautiful monuments of Bidar that cannot be missed. Gulbarga, which is now officially known as Kalaburagi, is in Karnataka and at a distance of 212 km from Hyderabad. This road trip will take around 4-5 hours to complete. The city of Gulbarga used to be under the Nizam Dynasty, which is evident from the beautiful Islamic architecture that is reflected through the ancient structures here. Gulbarga Fort is the place of prime attraction here. The Juma Masjid and tomb of the Sufi saint Khaja Bande Nawaz are the two main popular structures of the fort. Apart from this, Chandrampalli Dam, trek to the river Bhima, and Sharana Basaveshwara Temple are the places that can be visited. The temple town of Pattadakal is around 400 km from Hyderabad and is an 8hour journey. Go on a road trip with your family to visit the fascinating temples of Pattadakal, some of which come under the World Heritage Site. Virupaksha Temple, which is the largest temple in Pattadakal was built by King Vikramaditya II. This magnificent relic reflects the rich architectural knowledge of the Badami Chalukya Dynasty. Jain Temple, Kashi Vishwanath Temple, Galaganatha Temple are some of the many other temples that cannot be missed on a visit to Pattadakal. Badami is a picturesque town located almost 420 km from Hyderabad and makes for 8-9 hours journey. Although the duration might get a little strenuous, the destination is completely worth it. 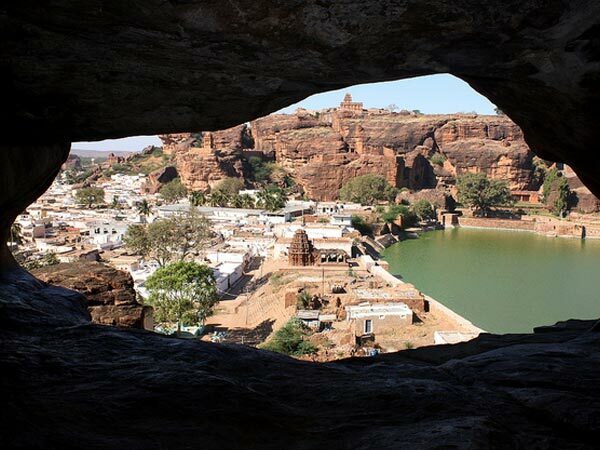 Famous for its cave temples, Badami has many other places of interest like the Agastya Lake, Bhutanatha Temple and Badami Fort. Badami once belonged to the Chalukya Dynasty and most of the work here is a result of the artisans from that era. The town has Jain, Buddhist and Hindu temples, thus binding all the religions in a single place. Located at a distance of 342 km, Machilipatnam or Masulipatnam of Andhra Pradesh is a drive of about 6-7 hours. The road trip to Machilipatnam can be savoured when you reach the destination and dip your feet or just dive into the tranquil Manginapudi Beach. Settled on the coast of this city, Manginapudi is a fishing village, where the beach is unique for its black soil. Panduranga Swamy Temple and a number of Lord Shiva's temples are some other places to visit here. The perfect getaway on a weekend would be a road trip to Kurnool, situated 219 km from Hyderabad and a drive of just about 4 hours. This former capital of Andhra Pradesh is a spectacular place that is perched on the river Tungabhadra. Belum Caves is the top attraction spot in Kurnool, which happen to be the second largest caves in India! Tomb of Abdul Wahab, Oravakallu Rock Garden and Konda Reddy Fort are other places of significance. Rollapadu Bird Sanctuary is a haven for bird-watchers so don't forget to take along a pair of binoculars!